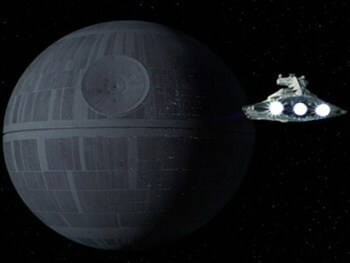 The U.S. government refuses to build a Death Star, so the internet is taking it to Kickstarter. Back in January, the U.S. government said "thanks but no thanks" to a petition calling upon it to begin construction of a Death Star. Exorbitant cost notwithstanding, the Obama Administration apparently has a policy of not blowing up other planets. But while that may have been the end of the matter a few years ago, this is the era of empowered consumers, and that means it's time to do some crowdfunding! The Open Souce Death Star Kickstarter has a goal of Â£20,000,000 - that's a little over $31 million - and before you ask, no, that's not actually the construction budget. The initial goal will fund the development of more detailed construction plans (a preliminary design is up on the Kickstarter page) and the cost of some chicken wire to cover the exhaust port; the first (and only) stretch goal of Â£543,000,000,000,000,00 ($850,000,000,000,000,000) will cover the full expense of building the thing. To keep costs as low as possible, the entire project will make use of open source hardware and software. The only real risk to the Kickstarter, according to its creator, is the power of the Force, while the primary challenge is to ensure everyone knows that this is actually a joke. To get that point across, the funding goal has been set high enough to make success "almost impossible." Almost. As amusing as this Kickstarter is, what makes it really interesting is that people seem determined to actually make it happen. Several comments point out that it's easy to donate the maximum of Â£5000 because the money isn't taken unless and until the Kickstarter is successful, and at that rate only 4000 backers are needed to push it over the top. At last check the Open Source Death Star Kickstarter had attracted a little shy of Â£200,000 in three days and had 52 days left on the clock. Can it happen? Will it happen? What happens if it does? Failure is likely but the dream of success is tantalizing - and don't forget that a man once asked, "What good are snub fighters going to be against that?" We all know how that worked out.